The Stream pushes warm water closer to the shore here than anywhere else in Florida. The water is very clear (we have 40-50 feet of visibility). 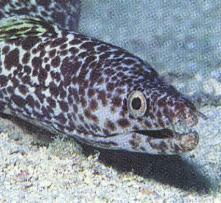 And the reefs here are home to more species of fish than anywhere else in Florida, as well. 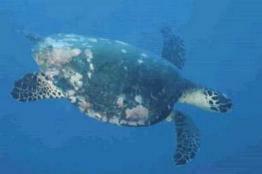 The area is well-known for having a large sea turtle population (see photo above). 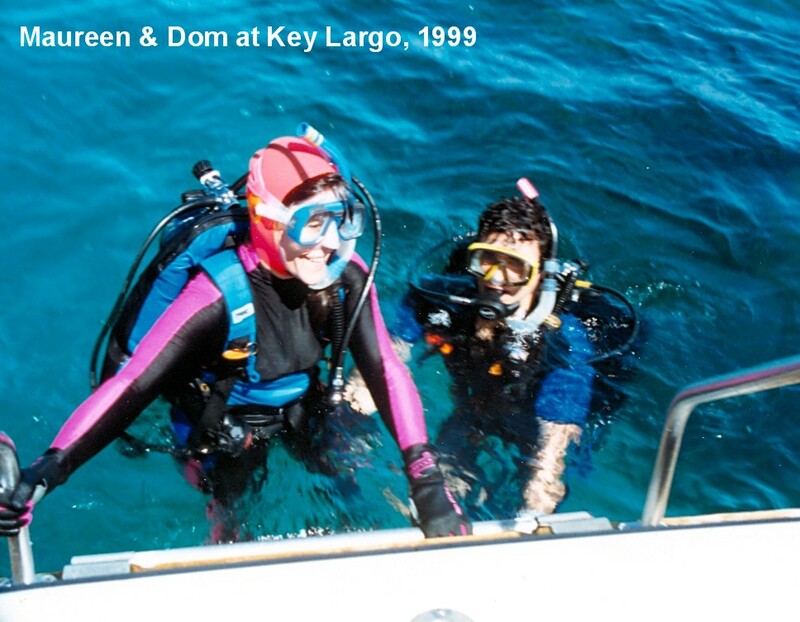 In the summer of 1999, my friend Maureen and I travel down to Key Largo, knowing it is a scuba paradise, and knowing that it was “Dive Week” because the lobster season has started. It turns out to be an extremely enjoyable and relaxing weekend. Our lodging is at Largo Lodge, which features full kitchen and bath facilities, and a front porch area perfect for wet scuba gear. 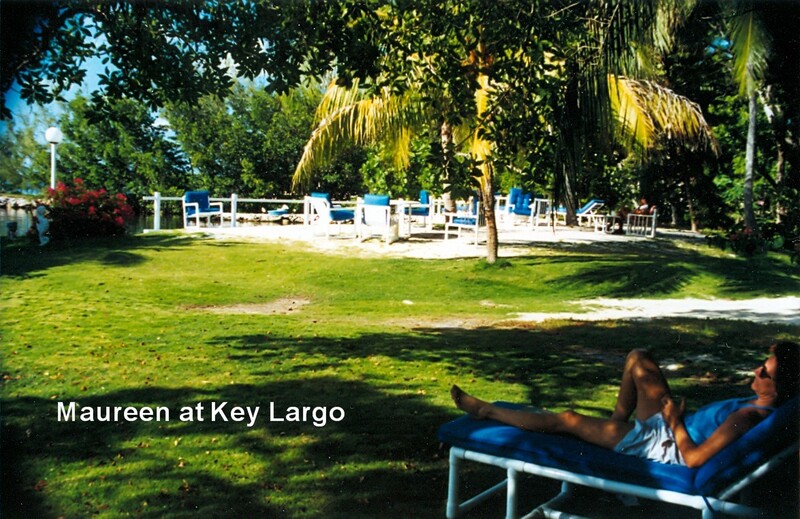 It is nestled within a very lush, tropical setting, enabling us to lounge at the water’s edge (the photo shows Maureen enjoying the ambiance). The lodge is just down the road from our dive outfitter—Quiescence Diving Services. [Qui•es•cence \kwi[long i]-es-n(t)s \ a state of repose; still; tranquil; serene]. Quiescence turns out to be a very good outfitter for our two days of diving. They feature friendly and helpful boat captains, and small, personalized boats (ours carries 6 divers), in stark contrast to the infamous “cattle boats,” which carry 30 or 40 divers. At first, I am somewhat apprehensive, since this would be my first open-water diving, and first dive in ocean water. But it turns out to be extremely pleasurable, safe diving in clear, warm, 30-50 feet of water. After the first day, I am very eager to do as much diving as I can. Suiting up is easy with only 6 divers (that’s me on the right, suited up and ready for a dive), and for the 2 days, we do 4 dives, each of which lasts 45 minutes to an hour (me and Maureen emerging from a dive in the photo below). 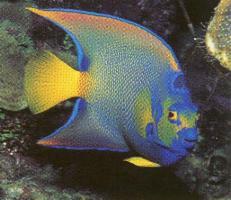 And each dive is in the Key Largo National Marine Sanctuary, which means that we see an abundance of marine life. Our first dive is at “Elbow Reef,” which consists of fingers of coral reefs we follow during our dive. On the way there, we see a large green sea turtle surface near our boat. The second dive on our first day is a drift dive along “The Slabs.” The drifting makes for an very low-energy, casual dive. On the second day, we dive “North North Dry Rocks Reef,” and we come across a big eel, several rays, and several spiny lobster (which we could not take because they are protected in the Sanctuary, and because we had no gloves). The coral on this reef was especially colorful. Our last dive is again at “Elbow Reef,” but this time we explore a 1917 shipwreck, as well as the nearby reefs. On both days, we are treated to an explosion of bright colors: queen angelfish, four-eye butterflyfish, brain coral, large flower coral, large snook, yellowtail snapper, yellow goatfish, soft coral, bowl coral, and elkhorn coral. Both nights after the dives, we are fortunate to find excellent restaurants with great views. In fact, while dining on our second night, we watch a spectacular, famous Keys sunset from our table (see photo below right). 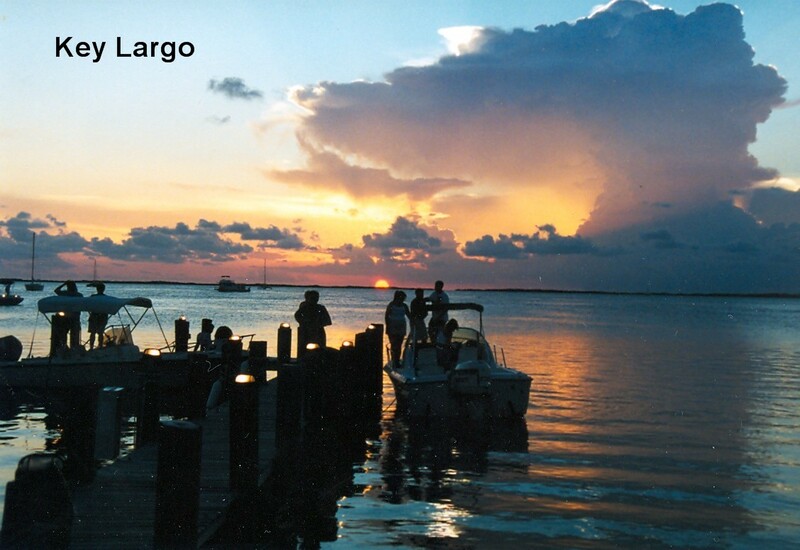 Southwest of Key Largo are the most extensive coral reef systems in the U.S. The John Pennekamp Coral Reef State Park and the Key Largo National Marine Sanctuary help protect the reefs. 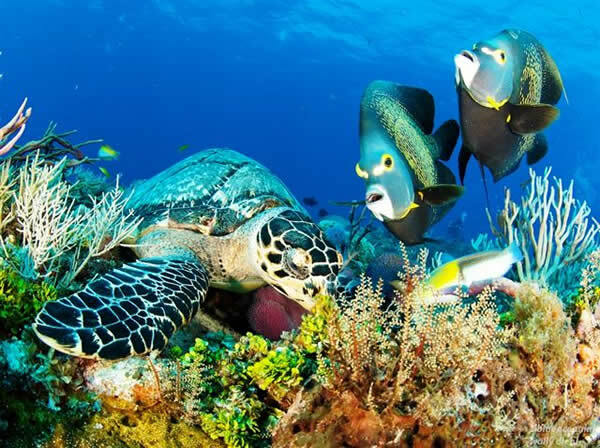 The reefs contain over 52 species of West Indies Corals and are home to 500 fish species. The Elbow is also known as the “wreck reef,” since it is littered with parts of various ships. Summer in Florida. Solution on this particular day is scuba diving with my friend, Maureen, at Manatee Springs. The springs flow into the Suwannee River a short distance from the spring head. The head discharges 96 million gallons a day of crystal clear spring water into the Suwannee, which is one-quarter mile from the spring head, and connected by a wooden boardwalk which passes through a cypress forest. The springs get their name from the fact that in the past, manatees (also known as “sea cows”) were found swimming into the spring run to escape the cool Suwannee River water in the winter (the spring water is 72 degrees year round). 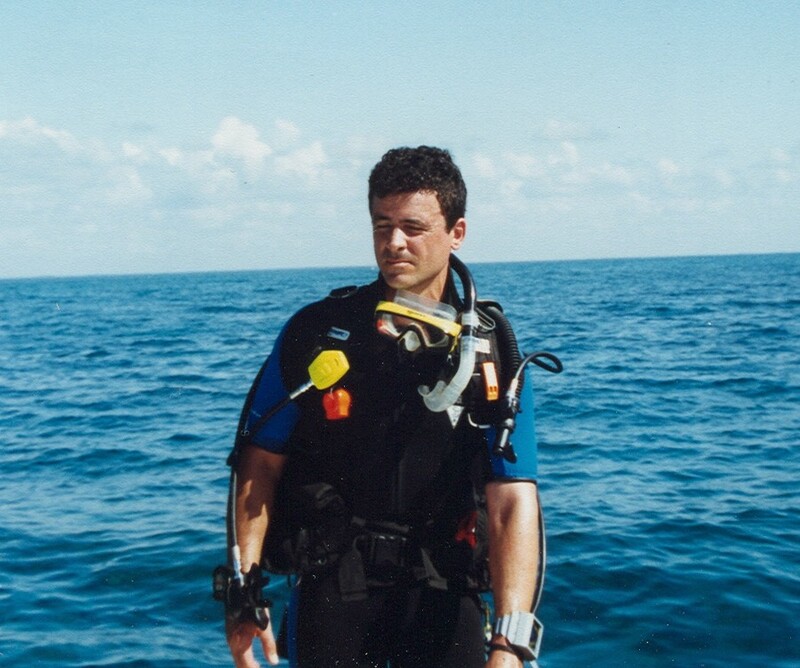 In May of 1999, I sign up for training to become certified for scuba diving, after several years of wanting to learn scuba. I am not expecting the level of training and fatigue that go into scuba certification. It involves several days of classroom study, 2 read-throughs of a scuba instruction book, and several exhausting pool and open water sessions. I nearly choke to death several times during the pool session, because I am unable to master the proper procedure for “mask clearing,” in which a flooded mask must be cleared underwater. As a result, I inhale a large quantity of water through my nose. It is not until I am home later that week to practice the skill in a friend’s pool (after being told I could not be certified if I could not master the skill) that I learn how to do it well. I am feeling down because I have problems with other skills, and feel like I am the worst student in my class. I am so depressed and scared that I am convinced that I would have to take the class again, or that I would drown during the open water session on the final week. The final weekend of open water training makes it all worth it, however. Despite feeling tremendous stress and anxiety on Saturday morning, I have an incredible experience at Rainbow River–one of the most colorful rivers in Florida. The spring-fed river gives several striking shades of blue, and the white sands and green grass beds add to the array of colors. After practicing skills, we engage in long drift swims along the river-both skin diving with our snorkels, and scuba diving. I will always have a memory of how incredulous and joyous I was when I first put my head underwater when we started the drift dive. “I’M BREATHING!! AND I’M UNDEWATER!!! AND I’M NOT DROWNING!! SO THIS IS WHAT IT IS LIKE TO BE A FISH!! WOW!!!! !” Both of these drifts are pleasant since they feature water with a visibility of approximately 100 feet, and a diverse, large collection of fish, including large bass, shad, perch, bluegill, and gar. At one point, our instructor picks up a baby snapping turtle, which snaps at the girls in our group when he puts the turtle in their faces. The scuba drift is quite relaxing. It is, by far, my longest underwater experience, and I enjoy it tremendously. It is wonderful to drift seemingly weightlessly in the very pretty river for 45 minutes without having to surface. Sunday, however, is even more of a treat. 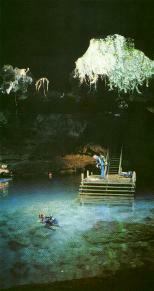 We visit Devil’s Den, just outside of Williston, Florida. For several years, I have wanted to visit this extremely unusual geologic formation. As you can see in the photo, the Den is a prehistoric underground spring INSIDE a dry cave. The remains of several extinct animal species (saber-toothed tigers, giant sloths, and mastodons) dating back 2 million years into the Pleistocene Era have been discovered inside the Den. Evidence of early humans, dating back 7,500 years, have also been found in the Den. Entry is by way of a long wooden staircase that is carved through a limerock formation at the surface. Descending 60 feet down to a wooden, floating platform, you find yourself in a large underground room that is lit up with sunlight streaming through a surface chimney and draped with long vines. The large limestone cave walls are completely vertical as they rise to the ceiling and chimney approximately 30 feet from the surface of the Den pool. The pool contains clear blue water that ranges up to 50 feet deep. The pool contains several large, black catfish. We watch them swarm our instructor as he feeds them fish food. Our training consists of two 30-minute sessions in which we gently swim in a large circle around the Den pool. Because much of the water is not reached by sunlight, we need to carry flashlights. The scuba experience here is fabulous. I feel as if I am floating in outer space, or on the lunar surface, as I drift-with “neutral buoyancy”-over the limerock formations on the bottom. The fossil beds at the bottom of the Den are 33 million years old. But compared to my erratic swimming pool experience the week before, both Rainbow River and Devil’s Den scuba are surprisingly relaxing and enjoyable. Now that I am certified, I am now exceptionally excited about going on exotic scuba diving trips to Belize, Antigua, West Palm Beach, Sarasota, the Great Barrier Reef, the Florida Keys, and the many crystal-clear springs in my backyard here in North Florida. 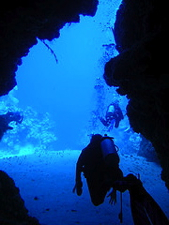 I recommend scuba to anyone who seeks the peak experiences that human life can provide. I would rank it with skydiving as one of the most spectacular adventures in my life.